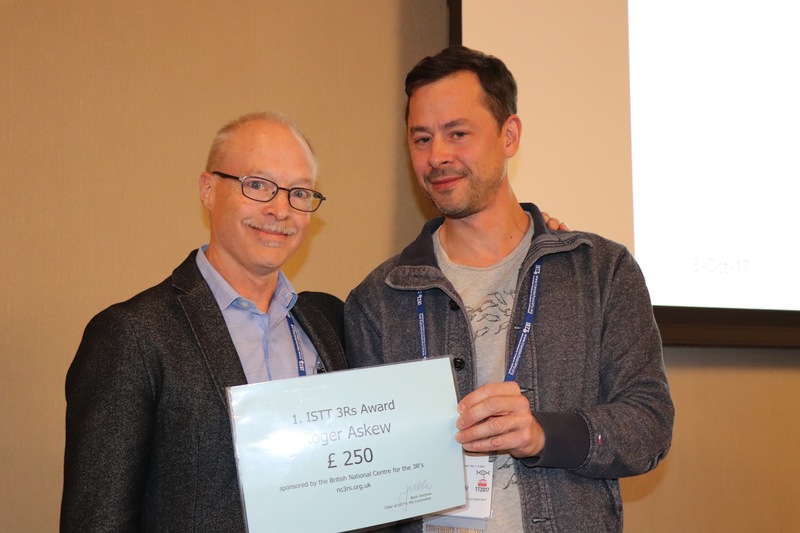 The International Society for Transgenic Technologies (ISTT) 3Rs committee are delighted to announce that the winner of the inaugural 3Rs prize, generously sponsored by the UK National Centre for the 3Rs (NC3Rs) is Dr Roger Askew. Roger has over twenty years’ experience in the pharmaceutical and biotechnology industry in development and phenotyping of translational animals models supporting drug discovery and basic science, and will accept the award as a representative of Ozgene Pty Ltd.
Dr Askew’s abstract describes multiple opportunities for reducing the number of mice required to generate novel chimeras that is now possible using Tsc22d3-null embryos as sperm deficient hosts. “Eliminating competition from host-derived sperm resulted in increased efficiency in terms of animals numbers required to develop new mouse strains and also provided a means of developing mouse strains using previously recalcitrant ES cells. The resulting cascade of efficiency includes reductions in: colony size required for host embryo production; numbers of host embryos required for chimera generation; numbers of chimeras required to achieve ES cell germline transmission and numbers of F1 offspring produced to identify germline transmission of the targeted mutation.” The potentially significant impact that the widespread application and use of this transgenic technology provides makes it a worthy inaugural winner of the ISTT 3Rs prize, the aim of which is to raise awareness of the beneficial 3Rs impact that transgenic technologies can have in relation to the use of animals for scientific research. The 3Rs committee would also like to take this opportunity to thank all the authors who submitted abstracts for consideration. It is clear that there are many individuals actively working to improve implementation of the 3Rs by replacing (partially or absolutely), reducing and/or refining their use of animals. If you are interested to find out more, Dr Askew will be giving a short presentation prior to receiving the award during the Ethics & 3Rs session at TT2017, our 14th ISTT meeting in Salt Lake City, Utah, USA (1-4 October 2017). We are delighted to announce that the author of the second placed abstract, Dr Lin Wu, has also accepted an invitation to give a short presentation during the session so we look forward to seeing you all there. 0 comments on "And the inaugural ISTT 3Rs Prize winner is ..."